Every now and then I make a card that just steals my heart. 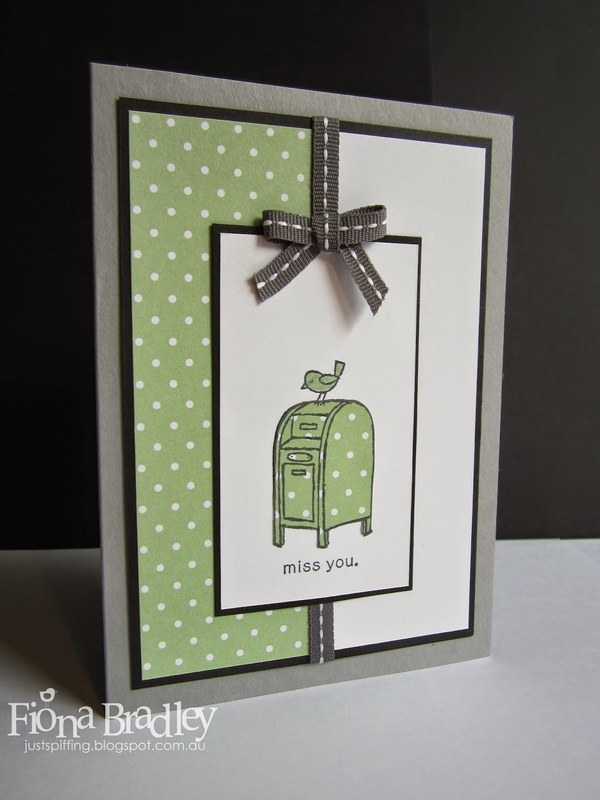 I absolutely adore this "missing you" card. I almost wish I had more people to send one to so that I could make more! A friend of mine is leaving town soon and I am going to miss him terribly, so making this cheered me up. 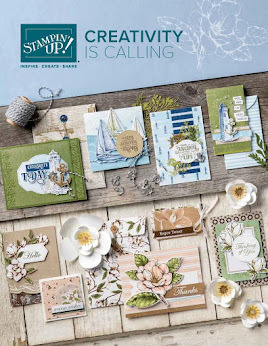 This card is easy to make but I will give you step by step instructions with dimensions so that you can just get your supplies together and go for it! 1) Use an A5 piece of Smoky Slate card stock, scored in half. 2) Cut a piece of Basic Black card stock 1cm smaller (13.8x9.5 cm), a piece of Whisper White card stock at 4.5x13.1 cm, and a piece of Pistachio Pudding Background Design Series Paper also at 4.5x13.1 cm. 3) Stick the two small strips together on the back before sticking them onto the black cardstock to make sure they are the same height and to make sure are stuck down with an even border onto the backing. 4) Cut a piece of ribbon (I have used Basic Grey Grosgrain Stitched which is retired now. You might like to use this Silver ribbon instead.) and put a little bit of glue or tape onto the back at intervals just to keep it in place when you stick it down over the join of the two small strips which are already stuck onto the black cardstock. Tuck the ends over the back and stick in place with glue or tape. Stick onto the Smokey Slate cardstock. 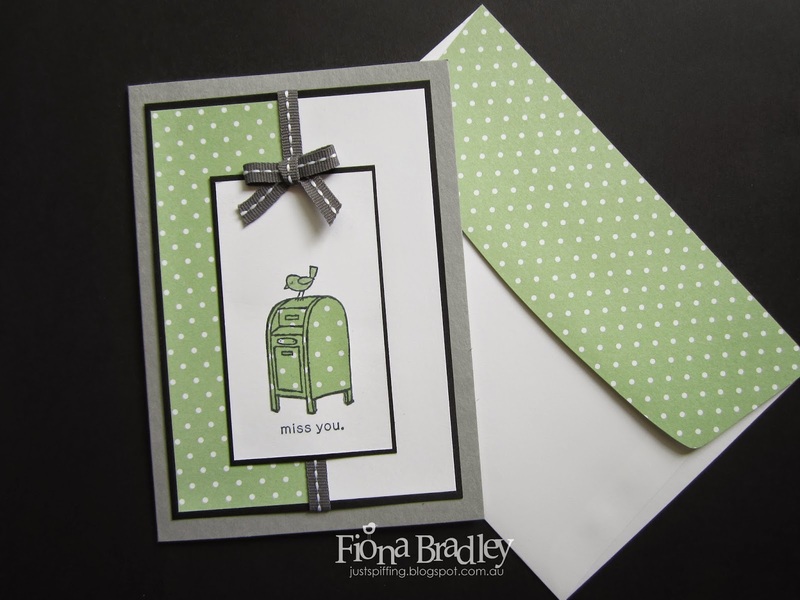 5) Cut another piece of Whisper White cardstock at 5x9 cm and stamp it with the miss you stamp from the For the Birds set. At the same time, stamp the image onto the Pistachio Pudding Background DSP. 6) "Fussy cut" (that means cut by hand - I LOVE my paper snips for this kind of work, they are so sharp and make cutting a breeze) the mail box out and stick straight on top of the image you already stamped on the Whisper White. 7) Colour the little bird in with a Pistachio Pudding marker. 6) Next stick that whole piece down onto the uncut Basic Black cardstock and then cut around it. It's fiddly to get it placed evenly if you have already cut your backing piece so when I only want a very thin border this is how I do it. 7) Stick that down onto your project, slightly towards the bottom (as you can see in the photo). 8) Finally, make a small bow to adhere to the ribbon at the top of the stamped up piece of card. I attached mine with a glue dot. I know that was a very detailed step by step, but I love the card so much, I wanted you to be able to CASE it as best as possible. Big shout out and thanks to Joan for the inspiration in the first place. You might prefer to use a different colour set. I'd love to see your own creations. Refer back to this post in your blog if you do and leave me a comment or send me an email so that I can take a look.